The Syfy channel has taken another genre series that seemed to be entertaining enough, and cancelled it. But it's not that Syfy was out to hatchet it. It's the lack of viewers tuning in that helped them make the decision to not renew the sci-fi series Alphas. The series premiered in July of 2011 and pulled in 2.5 million pairs of eyeballs. But Mondays might have bitten the series and the numbers slowly faded. By the end of season 2, the show was averaging just over a million viewers. And if it's anything we've learned, it's that Comcast's shrewd business eye won't tolerate a product that doesn't support itself, ala, Eureka. TV is a business, and that's something we all have to remember. 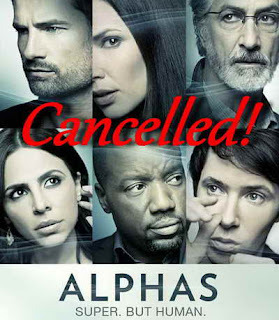 In a word about Alphas being cancelled, bummer.